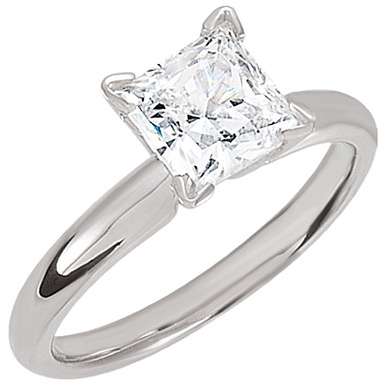 Princess-cut Moissanite solitaire ring set in 14k white gold. Moissanite measures 5mm x 5mm in size. Also available in platinum by request. This dazzling ring is a solitaire with a twist. In place of the traditional diamond is a moissanite, a white stone with incredible sparkle. This 5mm princess-cut gem has a high refractive index, which means that it's able to emit brilliant flashes of light; it's also quite durable, making it a lovely pick for a piece that will represent love for a lifetime. A 14K white gold band holds this unique gem and provides a cool, gleaming foundation to this modern classic style. We guarantee our Princess-Cut Moissanite Solitaire Ring in 14K White Gold to be high quality, authentic jewelry, as described above.